The Burgundy Plum produces plentiful yields, though it blooms and ripens later in the season than other varieties. Good in milder climates, the Burgundy Plum tree has fruit that is sweet with little or no tartness and a pleasing, mild flavor. You will be delighted by the beauty of this plum with its amber flesh and ribbons of red! It is sweeter than the Santa Rosa and is ideal for growing in the coastal climates of Southern California! With its semi-dwarf rootstock, this tree will reach 10 – 12 feet in height – perfect for smaller areas with easy-to-pick fruit! Producing larger and juicier fruit than European varieties, the Golden Nectar Plum tree requires fertile, well-drained soil. Its fruit has a small pit and is sweet and very flavorful, and best eaten fresh. 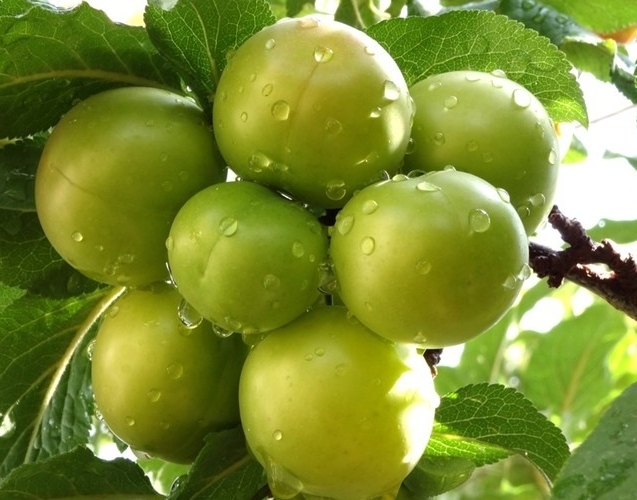 The Green Gage Plum tree, also known as the “Jefferson Plum,” produces medium-sized, greenish-yellow fruit that is notably sweet and juicy. Considered one of the finest dessert plum varieties, they were original imported into England from France in 1724 by Sir William Gage, their namesake. First introduced in 1919 by Luther Burbank, the Inca Plum tree produces a heart-shaped fruit that elegantly tapers toward the tip. Its skin is a beautiful golden color that, when ripe, has brilliant magenta specks and a magenta blush around the stem end. Its flesh is rich, dense and crisp. Originating from South Africa, the beautifully ornamental Kaffir Plum tree produces a small, red fruit with thin skin and a pleasantly sour flesh that makes it ideal for jams, jellies and preserves. 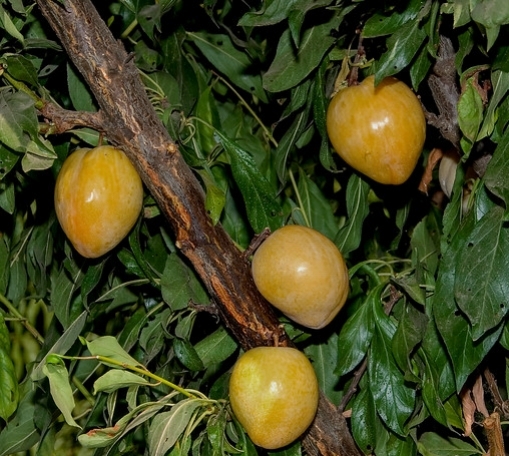 The Kaffir Plum tree produces best when a minimum of 3 trees are planted together, to ensure proper cross-pollination. 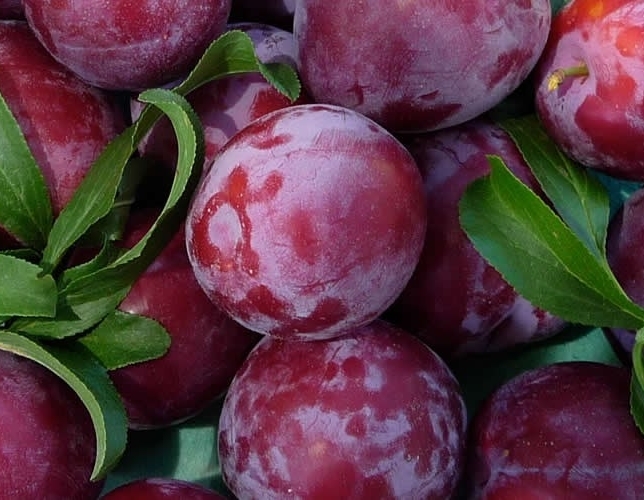 Created by Luther Burbank, the Santa Rosa Plum tree produces large, juicy purple-ish plums that are exceptionally flavorful and feature a smooth pulp. The fruit fully ripens in June and July, and makes for an excellent prune when dried. A graceful weeping version of the popular Santa Rosa plum. This semi-dwarf tree only grows 8 – 10 feet high and ripens in late-July. With a rich, pleasing flavor and beautiful weeping branches, this is a great pick for any backyard. One of the most popular varieties in California, the Satsuma Plum tree yields large, oval fruit that ripens in early August. Their mottled maroon-over-green skin and dark, meaty flesh make for a sweet, mild treat that has no tartness and is excellent for making jam. A grafted combination of two Plum varieties, the 2-in-1 Cherry Plum/Sprite Delight tree is an independent cross-pollinator and produces a combination of sweet and tangy fruits. Both are great for jam and jelly recipies, and can be infused into a deliciously flavored cocktail.